At Idyllwild Arts he studied classical bass instruction and improvisation and participted in the jazz ensembles gaining a foundation in music history piano and jazz piano and learning to write musical scores for films. He was the lowest vote receiver on the Top 11 result show but was saved by the judges; they chose to save him immediately stopping his supposedly last performance on the show halfway through it. On January 8 2012 Abrams signed with Concord Music Group. He was eliminated from the competition on April 28 2011 five weeks after being the third finalist to be saved from elimination by the judges. 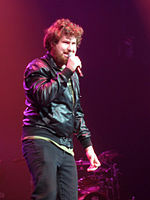 Casey Abrams (born February 12 1991) is an American musician and multi-instrumentalist from Idyllwild California who finiCasey Abramsd in sixth place on the tenth season of American Idol.